alaTest has collected and analyzed 18 reviews of LIFX A19 White and Colour Wireless Smart Lighting Adjustable Colour Changing LED Light Bulb with Built-in Wi-Fi, 11W A60 E27 Edison Screw Bulb, Single. The average rating for this product is 4.2/5, compared to an average rating of 4.5/5 for other products in the same category for all reviews. We analyzed user and expert ratings, product age and more factors. 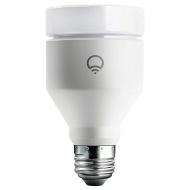 Compared to other products in the same category the LIFX A19 White and Colour Wireless Smart Lighting Adjustable Colour Changing LED Light Bulb with Built-in Wi-Fi, 11W A60 E27 Edison Screw Bulb, Single is awarded an overall alaScore™ of 88/100 = Very good quality. My first internet of things thing - a winner! A surprisingly useful and fun product! I think i've caught the Smarthome bug now! An easy to use smart product!